First time home buyers always start with the same question – Do I need a realtor or not? Well, some people prefer to do all the research, house hunting and make all the decisions themselves. While this isn’t a bad thing by any means when choosing to use a realtor you are still the person in charge when it comes to choosing all the aspects of the purchasing process. Just a few of the major benefits of using a realtor is having an industry expert on your side to help you navigate the sometimes difficult market and their wealth of resources you can tap to find a home that is right for you! Whether to buy a home or not is on a lot of people’s minds, especially millennials. In today’s market people are spending the same amount a month renting an apartment as they could on a mortgage payment on a home. Moving into a home is a big responsibility and not everyone wants the burden of a mortgage payment. If your family lives in another state, your job moves around, or you’re planning to travel frequently, buying a home is probably not the best option at the moment. If you have a stable job and your family is in close proximity then purchasing a home can save tons of money. Why pay for something you will never own? Whether you stay in the home long term or not, purchasing a home will save money. If you decide to leave the residence and move elsewhere you now own that property so you can rent it out and make income on it. Not only is there a possibility of a second income but there is the potential to get tax benefits. Homes also have a guarantee of return on your purchase after owning for 15-20 years. Think about spending $102,000 on a condo, you will now own it till the day you no longer want it. Now think about spending $102,000 on a rental property over a couple months. Yes, that rental will seem nice in the moment but at the end of those few months you will have payed $102,000 and now need to put more deposits down and rent another home. Neither renting nor buying is better but you will have different take always from each purchase. When renting you don’t pay for maintenance but you also don’t get to choose who does the maintenance, when they do it, and what appliances are in your rental. When you own a home you have full rein of what is in your home and who comes in your to fix it when something goes wrong. Buying and renting are both good options but in the long run purchasing a home will save money and provide you with more freedom to do as you please with the property. 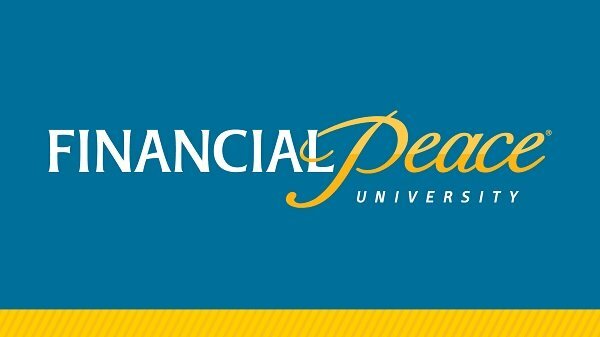 The TK team is excited to announce we will be hosting Financial Peace University again! This 9-week course will change the way you think about money, teach you how to dig yourself out of debt and help you to reach financial stability and comfort. I will go over the seven baby steps of Financial Peace along with how to create and stick to a budget and even how being generous can lead to more success. This course will provide you with the tools and tips you need to change your financial status. By changing the way you manage your money you can change your whole life. 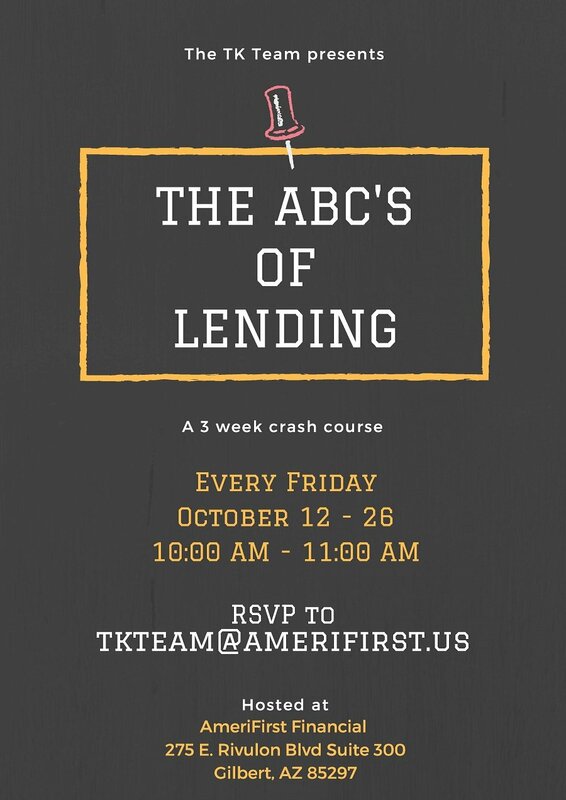 Excited to announce the ABC’s of Lending next month! The TK team is hosting the third annual Casino Night! Every year we take a night to thank our business partners, clients, and staff with a fun Casino Night event. The poker tables are ready, the cards are shuffled, we’ve dusted off the poker chips and we’re ready to party. Not only can our guests look forward to blackjack, but we’ll also have some amazing prizes, giveaways, treats and cocktails. The team is hard at work planning the awesome night and we can’t wait to see everyone. Although we could never thank our clients enough for the business they send our way, we sure try our best with this event! The last few years have been a blast and we are counting down the days for this one. Next week we’re kicking off our 6-week social media marketing boot camp. Every Friday from 10am to 11:30am our friend, Jon Storey, of First Arizona Title is giving us the rundown on social media and teaching everything you need to know when it comes to posting, content and so much more. Have an online presence is essential in the industry and while you may be posting, sharing, and engaging are you making sure that you’re establishing yourself as a credible industry expert? We’re teaming up with Mikel Erdman of MySMARTblog and RealtyBlogContent to bring you a class to teach you how to create a professional credibility online. 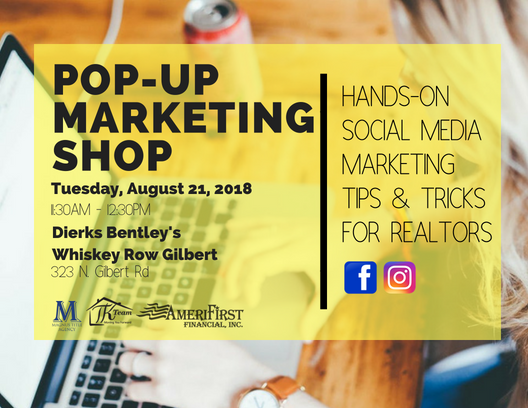 Join us August 15, 2018 from 11:30AM to 1:30PM to learn the essential steps to generate quality leads, SEO strategy and establishing and improving your online presence. The TK Team is fortunate enough to have some pretty incredible partners. This Friday one of those amazing partners is co-hosting an Open House class with us here at our office for local realtors. Friday, July 20th we invite you to join us 10am to 11:30am for Jon Storey’s class on marketing your open house!